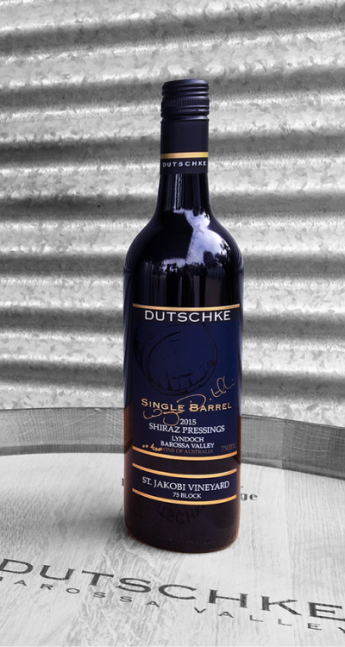 The 2015 Vintage went down in the Dutschke Wines record book as the earliest to start, and the fastest to finish. Conditions leading up to harvest were typically warm and dry, with only 56mm of rain falling between the months of August to December. We experienced a wet spell in January, giving the vines a much needed drink at an ideal time. From this point on, the grapes ripened rapidly, and before too long Vintage was upon us. Harvest began on the 9th of February and finished on the 20th of February. All grapes were off the vine and in to the winery within a record breaking 12 days. Every grape that we process is grown within 3km of the winery gate, with the majority being Shiraz. There is the potential for every vineyard to ripen at once. Anticipating this, we built the winery with plenty of fermentation space, and in 2015 that foresight paid off by allowing us to process so much of our fruit when the time was right. Shiraz from the 1975 planted block has been used over the years to produce our St Jakobi and Oscar Semmler Shiraz. The “75 Block” Shiraz was machine harvested on the 11th February with the fruit brought back to the Dutschke Shed to be crushed into one of our stainless steel open top fermenters. Wonderful flavour and tannin extraction during the 8-day fermentation suggested that we could keep pressings separate from free run wine without compromising the overall wine. On shovelling into the basket presses, the decision was made for the pressings wine to be transferred straight to barrel, a 300 litre French Oak Hogshead. The stand out barrel from 2015 was an easy choice for us, as this barrel of Shiraz Pressings was the only pressings barrel for 2015 and attracted our attention immediately. The barrel used was a 2015 Sirugue Allier French Oak Hogshead, and the wine was bottled just as we found it; unblended, unfined and unfiltered. At the time of bottling, this wine showed a wonderful flavour combination of generous ripe red berry, dark plums and black berries. An obvious backbone of spicy oak and soft mouth filling grape tannins give great structure. We are sure you will be able to enjoy this as a younger wine, but we recommend giving it at least 4 to 5 years to soften and develop in the bottle. The wine will also comfortably age and evolve for many years if a more mature wine is preferred. Just decant and enjoy with good friends! Not blended, not fined, not filtered, one barrel only (French, new). Rich, svelte, super-concentrated but super inviting. It’s not at all hard to take; indeed it’s moreish, in a hedonistic way. Dark chocolate, pure blackberry, saltbush and sarsaparilla. Velvety texture is a keen feature. Stunning combination of concentration of mouthfeel.